Lasers cutting metal like butter in Houston. Our lasers can cut through 1″ thick metal. They can hold +/- .003″ on thinner gauge metals. Lasers love cutting stainless steel. The 3d U44 Tube Laser Laser allow complicated shapes in square and round tubing in a fraction of the time. They also perform 3D cutting of tube, including rectangular and triangular pipe as well as C, H, I and L beams. 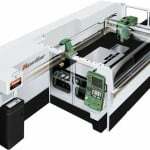 The five-axis torch and simultaneously controlled 3 axis chuck fabricate – precise angle cuts, weld-prep bevels and advanced, complex contours such as saddle joint cuts. 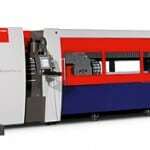 Lasers provide little distortion and minimize secondary machining – smooth edges and minimal to no Dross or Burrs. Parts fall out clean and ready for shipment. Unsurpassed productivity across the whole range of plate and gauge metal thicknesses thanks to the latest cutting technologies, the highest cutting speeds, the lowest overhead times, and outstanding process reliability. 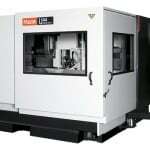 Mazak U44 Tube Laser – Cutting square and round tube in stainless steel, aluminum, and carbon steel.